Sinkholes, like the one that recently opened up near Legoland in Winter Haven are common in Florida. While most sinkholes don’t result in the kind of tragedy that cost a Tampa area man his life earlier this year, they do occur fairly regularly and can pose a significant risk to property. In this blog post, we’ll explain a little bit about how sinkholes form and why they are so common in Florida; we’ll also give you a few suggestions on how to protect your property from sinkholes. Sinkholes result naturally from Florida’s unique combination of limestone bedrock and surface/groundwater chemistry. Much of Florida has what are commonly called karst features underground. Karst topography is often described as cavernous underground terrain consisting of pits, crevices, voids, underground rivers, etc. Karsts arise because Florida’s bedrock is made of limestone; which is an alkaline, calcium rich sedimentary rock. Limestone’s solubility in water and weak acids causes it to become porous; gradually, surface water made slightly acidic by Florida’s soil seeps down into the alkaline limestone and dissolves it. Over eons, this process gives rise to the fissures and caves we see today. If the cavern that develops is close to the surface, it can cause a sinkhole when the sediment (soil or clay) that constitutes the ceiling of the cavern settles or collapses into it, under its own weight. Complicated geological explanations aside, from the surface sinkholes can be described quite simply as large depressions in the ground which can vary considerably in terms of depth and width. Readily identifiable by their round shapes, many of Central Florida’s lakes are simply sinkholes which have filled with water. While their true geological lifetimes span millennia, as viewed from the surface, sinkholes may open up gradually over a period of days or months, as in the case with the Legoland sinkhole; or they can evolve extremely rapidly as the ground’s surface collapses in minutes. This was the case with the sinkhole which opened up under a Tampa man’s home earlier this year, tragically taking his life. Fortunately, rapid-collapse type sinkholes are extremely rare. The Legoland type sinkhole is much more common. 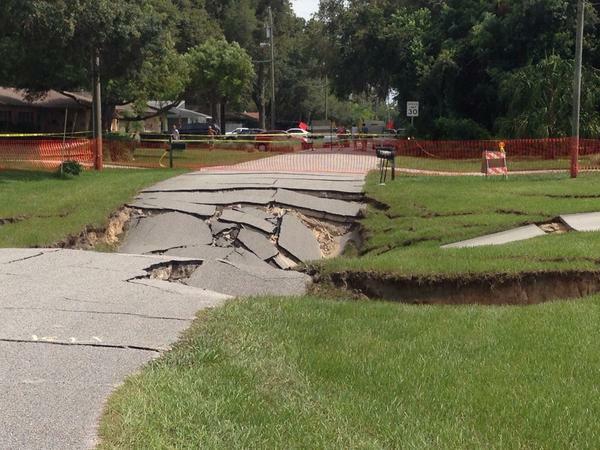 Florida’s karst geology means that predicting where or when a sinkhole will occur is extremely difficult. 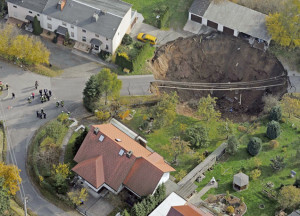 Even with modern drilling equipment, sophisticated analysis of soil/rock samples in the lab, and ground penetrating radar, professional engineers and geologists still have an exceptionally challenging time predicting where, or even if, a sinkhole will occur. 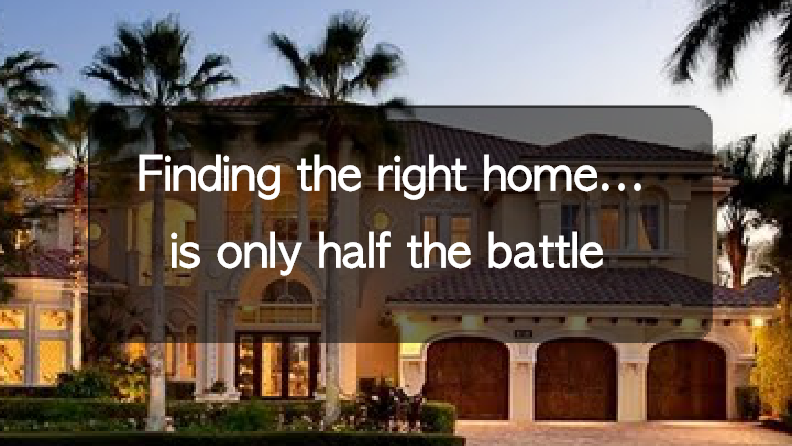 The implications for homeowners are mixed. On the one hand, if a sinkhole opened up a few blocks away from your house, there isn’t necessarily any reason to expect that you will have a similar experience. On the other hand, if you live in an area that’s free of reported sinkholes, there’s no guarantee it will stay that way. Needless to say, the common occurrence of sinkholes in Florida, coupled with the difficulty in predicting where exactly they will open up causes many homeowners a fair amount of anxiety. The good news is that sinkholes rarely pose a threat to human life. They do certainly cause structural damage to buildings, but this can be mitigated through insurance. In fact, many insurance companies that operate in Florida provide sinkhole coverage. These companies also have the right to deny you coverage if there are sinkholes in the ‘area’ around your prospective home. The term ‘area’ is loosely defined and policies between companies differ, so it’s best to shop around for pricing and availability. Chances are, even if you’re in a risky ‘area’, there will still be someone willing to provide coverage. If you’d like to see a map of sinkholes throughout Florida, check out the MoversAtlas MoveMap, it contains sinkholes and other ‘subsidence features’ throughout the state. The map is composed of voluntary sinkhole reports, so it tends to biased towards populated areas. It’s important to note that there are several maps (some of which are proprietary) used by insurance companies to quantify sinkhole risk, so the one you’re looking at here may be different from what your agent is using, but will give you an idea of how many sinkholes are in your community. Good luck with your home search!